Unrealized Loss - What Does It Mean? What is an "unrealized loss"? 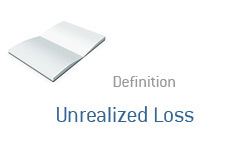 What is the definition of an "unrealized loss"? An "unrealized loss" occurs when an asset drops in value below the price that was paid for it, but hasn't been sold. Example: You buy 1,000 shares of XYZ at $40. The price of XYZ drops to $35, but you continue to hold on to your shares. You would have an "unrealized loss" on your position of $5,000 (1,000 shares x $5/share). If you decided to sell your shares at $35 and take the loss, then you would have a "realized loss" of $5,000. An "unrealized loss" is also sometimes called a "paper loss", meaning that the loss has just been sustained on paper and hasn't actually "been taken" as of yet. Example #2: You to decide to buy a house at a cost of $400,000. A year goes by, and a few of the major factories in the area that you are living decide to shut down. Many residents decide to list their homes at the same time, which results in real estate values throughout the area dropping considerably. Your house is appraised at a total value of $350,000, down $50,000 from the price at which you bought it. You have no plans to sell, so you have an "unrealized" or "paper" loss of $50,000.